In the summer of 2018, I visited two of my friends, a married couple who live outside of San Diego. During my stay, these two almost-locals showed me some of their favorite spots and explored new places with me. One of the days was spent almost entirely at Balboa Park. There’s so much to see and do here, it’s definitely worth the visit. Here’s a list of the highlights! Parking: There are 10 parking lots spread across the park grounds. Off Park Blvd: There are two decent sized lots in front of the Spanish Village and theNAT. A small parking lot is near the Zoo and Carousel. Another three behind the Fleet Science Center. Off El Prado / Cabrillo Bridge: There is a large parking lot near the Archery Range. Off Pan American Rd: Three more lots are found near the Hall of Champions and Pan American Plaza. These can be reached either by Park Blvd. or El Prado. There are A LOT of museums within Balboa Park — 16 Museums to be exact. Visiting all of them will take more than one day and probably more money than you’re willing to spend. I suggest picking a few that interest you the most and see those. Leave the rest as an excuse to come back to San Diego in the future. I only had time and cash enough to see one: The Museum of Man. Admission Fee: $13 per adult. Museum + California Tower Tour is $23 per adult. (The price for the Museum, Tower and the special exhibit is the best deal at $25). The origins of this museum date back to 1911 when San Diego was in the planning stages for its Panama-California Exposition to be held in 1915. The main exhibition was to be The Story of Man Through the Ages housed in the California Building. This grand Spanish-styled building served as the entry to the exhibition, greeting visitors after they crossed the iconic Cabrillo Bridge.When the exhibition came to an end, San Diegans had the foresight to create an association to retain and preserve the collections. By the 1940’s the focus on archaeology led to a name change: The Museum of Man. As decades passed, the focus narrowed even further to Western civilizations, but allowing temporary exhibits to provide a “cross-cultural perspective”. From ancient civilizations to myths to modern day culture, Museum of Man offers a wide array of exhibits. It’s also an interactive museum, making it a great option for families or those looking for fun photo opportunities. Take the California Tower Tour – For the best views of Balboa Park, and to learn some of the park’s history, take a tour of the California Tower! From the tower you can see Downtown San Diego, Balboa Park, the Ocean, and even more on a clear day. Note: Museum of Man has no air conditioning. If you’re visiting in the summer, make this one of your first stops in the park! Another reason to visit early is for better photos from the California Tower (after noon is usually to bright). Find out more about the exhibits that were on display during my visit by reading my post on the Museum of Man. If fossils, skeletons, California habitats and other scientific discoveries throughout history is your cup of tea, check out the San Diego Natural History Museum (aka the NAT). A little history: A small group of naturalist enthusiasts formed the San Diego Society of Natural History in 1874. After the exposition, the society purchased a vacant building in Balboa Park for its growing museum. After celebrating 50 years, the society decided that the Natural History Museum deserved a permanent home within Balboa and its current building was built (though sparsely due to the Depression) and dedicated in 1933. Further renovations were made during and after WWII, when the building was used as an Infectious Diseases Ward. Note: Look for the Moreton Bay Fig Tree out front! The tree was planted for the exhibition in 1915 and is one of the largest fig trees in the state. There is a barrier surrounding the tree to help protect it. Hours: 10 am – 5 pm (6 pm on weekends), 365 days a year! The Fleet Science Center is more than a museum, its a Planetarium and a means of engaging people of all ages to the wonder of science! From movies to star shows to hands-on exhibits, Fleet Science Center is a great museum to introducing kids to our world through science. The adults may learn a thing or two, too! Visit their website to see what exhibitions and movies are available during your visit! Note: The Fleet Science Center is located near the beautiful Bea Everson fountain! Inside a midcentury modern building, artwork is on display in an intimate setting with no barriers, and is “considered one of the finest small museums in the world.” Collections range from “14th-century altarpieces through 18th-century portraits and landscapes to 19th-century still life paintings.” This small museum is perfect for art lovers who don’t want to feel rushed, but want to enjoy every painting on display. In addition to free guided tours, audio tours are available if you download the Timken App. You can also make an appointment for a tour by emailing [email protected]. Note: This museum is located between the San Diego Museum of Art and the Botanical Building, alongside the lily pond. The closest parking lot is Alcazar. The San Diego Museum of Art (SDMA) offers “a broad collection of European, American, Latin American, and Asian Art.” There are over 20,000 objects dating back to 5,000 B.C. on display. The museum features “internationally recognized artists such as Matisse, Dalí, Magritte, Monet, O’Keeffe, Durand, Cassatt, Rivera, Tamayo, Miró, Calder, Eakins, Moore, and Hepworth.” The SDMA seems to have a little bit of something for everyone! Some history: The success of the 1915 Panama Expo, which displayed San Diego’s art and culture at its best, convinced civic leaders that San Diego needed its own fine arts gallery. Inspired by the Panama Expo, architects and designers began construction on the museum’s new home in Balboa. The gallery opened to the public in 1926 and continued to grow its collection until WWII broke out. After the attack on Pearl Harbor, many of the pieces at the museum were relocated to other museums while others found a temporary home in a mansion on Sunset Boulevard. During this time the SDMA was a operated as a navy hospital, like many of the buildings in Balboa Park, until 1947. Post-War times brought further expansion to the SDMA. The first addition was the West Wing in 1966, followed by an auditorium, the Sculpture Garden, a school, and many new works of art. From Miniature Railroads to a Veteran’s Museum, there are plenty of opportunities for learning while visiting Balboa Park. You can easily spend a whole day, or two, in this park. Pick your must sees ahead of time to determine how much time you want to devote your itinerary to this beautiful greenspace in the heart of a bustling city. On top of all of these options, a Comic-Con Museum is coming soon, too! I spent half a day in Balboa Park and only saw 8 attractions (Museum of Man, Spanish Arts Village, Alcazar Garden, Zoro Garden, the Botanical Building, Palm Canyon, Japanese Friendship Garden & Organ Pavillion). Get the Balboa Park Explorer Pass! If you have time to Visit 5 Museums in One Day, purchase the Balboa Park Explorer Pass for $48! Do you have a whole week to explore what Balboa Park has to offer? Purchase the Explorer Pass that’s good for one week and provides entry to all 16 museums for $59! Parking: There is a small parking lot next to the Spanish Arts Village and Merry Go Round. Another larger parking lot is across the street by the Natural History Museum. The Spanish Village was built to replicate village life in Spain for the second California Pacific International Exposition in 1935. Two years later it became home for several artists. Over the past decades, artists have maintained the beauty of this space with colorful paintings and flowers. Today, the village is a community of 200 artists, sharing one large space and selling their artwork to locals and tourists alike. If you want to take fun photos, buy unique gifts, or partake in an event, this is the place to visit. I bought a beautiful painting of the Village as my souvenir. The Theater is a replica of the one built for the California Pacific International Exposition. Today it is used by several organizations, including the Botanical Garden Foundation and the Civic Dance Arts, for meetings and events. The theater is used by youth organizations, including the Youth Ballet. The theater and attached venues are located between the Botanical Building and the Natural History Museum. The Old Globe is a Tony Award winning theater, having sent 20 productions to Broadway since 1987. It’s also the sixth largest regional theater in the United States. The theater was built in 1935, modeled after Shakespeare’s Globe Theatre in London, for the second California Pacific International Exposition. The Old Globe shares a similar fate with it’s inspiration. In 1978, the Old Globe was destroyed in a fire. As the building was being reconstructed, a Festival Stage was built to host the National Shakespeare Festival. This was replaced by the Lowell Davies Festival Theatre in 1985, after another fire burned down the Festival Stage. Located near the Museum of Man and the Museum of Art. The closest parking is at the Alcazar Parking Lot off of El Prado. If you plan on seeing a show at the Old Globe, their website recommends arriving at least an hour early to secure parking. Pre-paid valet parking is also an option for evening shows. For more information, click here. For tickets and show information, check out the Globe’s Website here. Keep in mind that the Box Office is closed on Mondays if you plan on buying tickets in person. Enjoy a free, outdoor concert in Balboa Park! Bring a picnic, pets, friends, and cushions for your tush and have a wonderful evening or afternoon of music at the Spreckles Organ Pavilion. This outdoor concert hall is located between the Japanese Friendship Garden and the Palm Canyon. Check out the website for upcoming concert information! The organ pavilion first opened on December 31, 2914. President Woodrow Wilson, from across the country at his desk in D.C., pressed a telegraph button which set off fireworks, turned on the pavilion’s lights, and officially launched Panama-California International Exposition. Not only was the Spreckles Organ the first of its kind, it is the largest outdoor organ in the world. 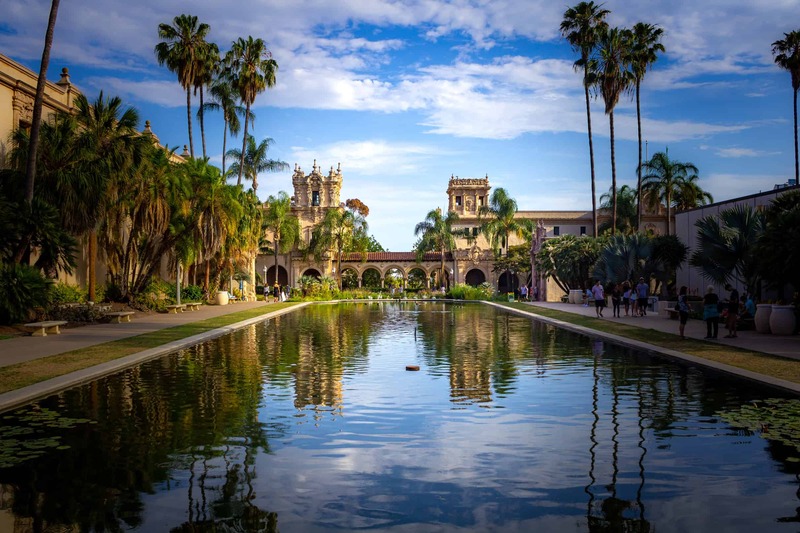 See the famous Botanical Building and Lily Pond in Balboa Park. It’s hard to miss this beautiful spot within the park, and it’s definitely worth seeing. The view of the Lily Pond from both ends is one of the most photographed spots in the park. The Botanical Building was built for the 1915 Panama Expo and is one of the largest lath structures in the world. (Lath is a building structure where thin, narrow pieces of wood or metal are used in lattice or trellis works. The entire roof is made with this process.) Inside are a collection of 2,100 permanent plants and seasonal flowers. The walkways inside are narrow, so keep that in mind if you have strollers or traveling with a large group. The Friendship Garden is divided into Upper and Lower gardens, the lower also known as the Canyon. When entering the garden, you’ll follow the upper path past the Exhibit House, the Oribe-doro and Koi Pond, and through the Charles C. Dali Memorial Gate. The lower path descends into the canyon and follows a stream. At the end of the stream is a beautiful waterfall and the Inamori Pavilion. behind the Pavilion is a courtyard and the restrooms. Wondering who the friend is in this friendship garden? It’s San Diego’s sister city, Yokohama. The garden was first opened in 1991. An exhibit hall, activity center, and Koi Pond were opened in 1999. The last addition, spread over 9 acres, included the Inamori Pavilion and water feature and opened in 2015. When I visited in the summer of 2018, there was more construction occurring beyond the stream and a children’s garden was in the works behind the Inamori Pavillion. Remember your garden etiquette! No food or smoking allowed in the gardens. Stay on the paths and do not feed or touch the koi fish! Refrain from shouting; its a peaceful place. When to visit based on the Floral Calendar: During the month of February, you’ll see the Flowering Peach Tree, Japanese Cherry. March is a popular month with Braford Pear, Chinese Fringe, Flowering Peach tree, Japanese Wisteria, and the Japanese Cherry all in bloom. During April, in addition to many of those still in bloom from February, you can see Iris, Pink Trumpet, Promegranate on full spring-time display. As summer approaches, May blooms include Gardenia, Iris, Promegranate, Star Jasmine, and Yellow Day-lilly. June is when Gardenia, Magnolia, Star Jasmine, Yellow day-lilly, and Hydrangea are in bloom. As temperatures rise, less flowers are in bloom. I visited in July when Crape Myrtle, Magnolia, and Hydrangea were the main flowers in bloom. If you cannot visit during these months, don’t worry. From December to June, the Candelabra Tree is in bloom and Azalea and Camellia are in bloom year-round. This beautiful garden, tucked away next to the San Diego Art Institute and Mingei Museum, is perfect for photo shoots or resting on a bench. Its design was inspired by the gardens of Alcazar Castle in Seville, Spain, and is named after the same. To the right of the Organ Pavillion, down a flight of stairs, is the Palm Canyon. It was different from what I had pictured. Mostly overgrown, with two main pathways that only connected at one spot, the Canyon was a bit of a let down. There were a few other people strolling on the dirt paths, but it seemed to mostly be favored by those walking their dogs. But, if you’re a palm tree lover or in need of some tropical-vibe photos, then take the time to enter the canyon. This is a very tiny butterfly garden. There weren’t too many flowers in bloom during July, so I didn’t take any photos or stay longer than maybe two minutes. The winding garden paths descend down to form a sunken garden. You can sit along the short walls of the garden, but its not really a garden for sitting like the Alcazar Garden. It looked as though you could continue walking, but we weren’t sure for how far, so we went back up and made our way to the Japanese Friendship Garden. If you walk by the Zoro Garden, continue walking behind the Casa del Balboa building and you’ll enter this beautiful courtyard space behind the House of Hospitality. The garden was originally designed for the 1935 Panama Exposition and modeled after the Moorish gardens of Ronda, Spain. After renovations in the 1990s, including the addition of a replica of the wishing well in the Guadalajara Museum of Gardens, the garden was rededicated. If you need garden inspiration, this is where you should stop. Across the road from the Natural History Museum and Spanish Arts Village is another large park space. Here is where you’ll find the Rose Garden and the Desert Garden. Peak blooming time for the Desert Garden is between January and March. There are over 1300 species of plants in a 2.5 acre space. If you’re interested, cross the Pedestrian Bridge at Park Blvd to see these gardens. These are just a few of the gardens in Balboa Park. For a more detailed list, click here. Need something to Eat? Here is a list of the restaurants and cafes in Balboa Park. We chose to leave the Park and eat somewhere else, so I cannot give a recommendation on where to eat during your stay. There is plenty of picnic spots, however, so if packing a meal is an option for you, I suggest doing so and save some money. Note: The San Diego Zoo is next door to Balboa Park. I do not suggest trying to squeeze in both locations in one day. Have you been to Balboa Park? What’s your favorite spot? Wow so much to do in one park. I never remember this from my trip to SD although we are talking over 30 years ago. I love the idea of the Japanese Friendship garden. I wish every city could have a place like this. It’s so nice to have so many museums and outdoor spaces within walking distance!